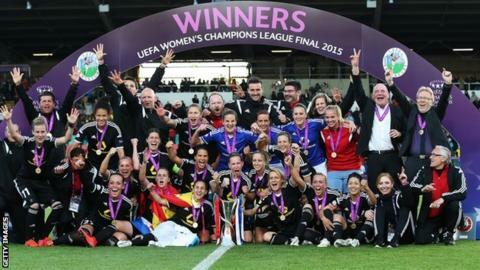 Women's FA Cup winners Chelsea Ladies will face Glasgow City in an all-British tie in the Women's Champions League round of 32. Reigning-Women's Super League champions Liverpool, the only other remaining British side in the competition, will meet Italian outfit Brescia. Chelsea will be making their debut in Europe, while Glasgow City reached the quarter-finals last season. First legs will be held on 7-8 October, with the second legs on 14-15 October. As the seeded teams in their respective ties, Liverpool and Glasgow City will play at home in their second legs. Holders Frankfurt, who are managed by Englishman Colin Bell, won the title for a record fourth time when they beat Paris St-Germain in last season's final in May. The German side will begin the defence of their title against Belgian side Standard Liege.